Is the knighting of Salman Rushdie, 60, by the queen of England "a sign of the changing mood" toward British Muslims, as Observer columnist Nick Cohen wrote? Is it "a welcome example of … British backbone," as Islamism specialist Sadanand Dhume described it in the Wall Street Journal? I think not. Rather, the knighting, announced June 16, was done without heed of its implications. Most of the uproar against the honor is taking place in Pakistan, as it did in 1988, when Sir Salman's novel, The Satanic Verses, was initially published. "We deplore the decision of the British government to knight him," a Foreign Ministry spokeswoman said The lower house of parliament unanimously passed a government-backed resolution calling Rushdie a "blasphemer." Most extraordinarily, Pakistan's minister of religious affairs, Mohammed Ijaz ul-Haq, endorsed suicide bombing against the United Kingdom. "If someone exploded a bomb on his body, he would be right to do so unless the British government apologizes and withdraws the ‘sir' title." Ijaz ul-Haq later added that "If someone commits suicide bombing to protect the honor of the Prophet Muhammad, his act is justified." A trade union offered a $160,000 reward to anyone who beheads Rushdie. Iran's speaker of parliament, Gholamali Haddadadel, threatened that Muslims "will not leave this imprudent and shameless act without response." Such reactions from on-high spurred Islamists to the streets in many cities, including London's, burning effigies of Rushdie and Queen Elizabeth and chanting slogans such as "Death to Rushdie! Death to the queen!" Fortunately, some Muslims decried these reactions. Canadian writer Irshad Manji noted that the Pakistani government had nothing to say about "assaults on fellow believers" in Kabul and Baghdad, where Islamist terrorism killed more than 100 Muslims. "I am offended that amid the internecine carnage, a professed atheist named Salman Rushdie tops the to-do list," she wrote. These Islamist threats extend a drama begun on Valentine's Day, 1989 when Ayatollah Khomeini issued his death edict against Rushdie, stating that "the author of the book entitled The Satanic Verses – which has been compiled, printed, and published in opposition to Islam, the Prophet, and the Qur'an and all those involved in its publication who were aware of its content, are sentenced to death. I call on all zealous Muslims to execute them quickly." That very day, I went on television and predicted that the novelist would never escape the edict. He, however, experimented with appeasement in 1990 and with self-delusion since 1998, when the Iranian foreign minister declared his government no longer intent on murdering him. Rushdie wishfully deemed this "a breakthrough," concluding that the Khomeini edict "will be left to wither on the vine." I warned Rushdie in 1998 against his giddy insistence on being in the clear. For one, the edict remained in place; Iranian leaders do not believe themselves competent to undo it (a point reiterated by an ayatollah, Ahmad Khatami, just the other day). For another, freelancers around the globe could still nominate themselves to fulfill Khomeini's call to action. 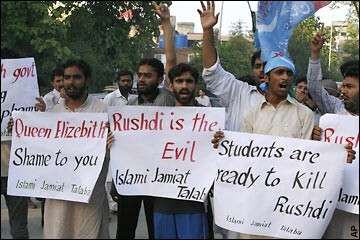 But Rushdie and his friends ignored these apprehensions. Christopher Hitchens, for example, thought Rushdie had returned to normal life. That became conventional wisdom; such insouciance and naïveté – rather than "backbone" – best explains awarding the knighthood. I welcome the knighting because, for all his political mistakes, Rushdie is indeed a fine novelist. I wish I could agree with Dhume that this recognition of him suggests "the pendulum has begun to swing" in Britain against appeasing radical Islam. But I cannot. Instead, I draw two conclusions: First, Rushdie should plan around the fact of Khomeini's edict being permanent, to expire only when he does. Second, the British government should take seriously the official Pakistani threat of suicide terrorism, which amounts to a declaration of war and an operational endorsement. So far, it has not done that. Other than an ambassadorial statement of "deep concern," Whitehall insists that the minister's threat will not harm a "very good relationship" with Pakistan. It has even indicated that Ijaz ul-Haq is welcome in Britain if on a private visit. (Are suicide bombers also welcome, so long as they are not guests of the government?) Until the Pakistani authorities retract and apologize for Ijaz ul-Haq's outrageous statement, London must not conduct business-as-usual with Islamabad. Now that would constitute "British backbone." Mr. Pipes, director of the Middle East Forum, is author of the 1990 book, The Rushdie Affair.